INTRODUCTION: Acute gastric prolapse (AGP) represents a sudden or forceful migration of the distal anterior stomach through the more proximal laparoscopic adjustable gastric band (LAGB) stoma, representing a surgical emergency. The current management of acute gastric prolapse often results in removal of the LAGB, extensive manipulation of a friable or hemorrhagic stomach or extensive dissection of ill-defined or edematous retrogastric tissue planes in an attempt to replace the LAGB. In this case series, three patients are presented who underwent a novel surgical approach to this complex clinical issue. METHODS: Three instances of AGP were gathered from a review of 2300 LAGB procedures at a single institution with a dedicated center for bariatric surgical specialties. This represented an incidence of 0.15%. 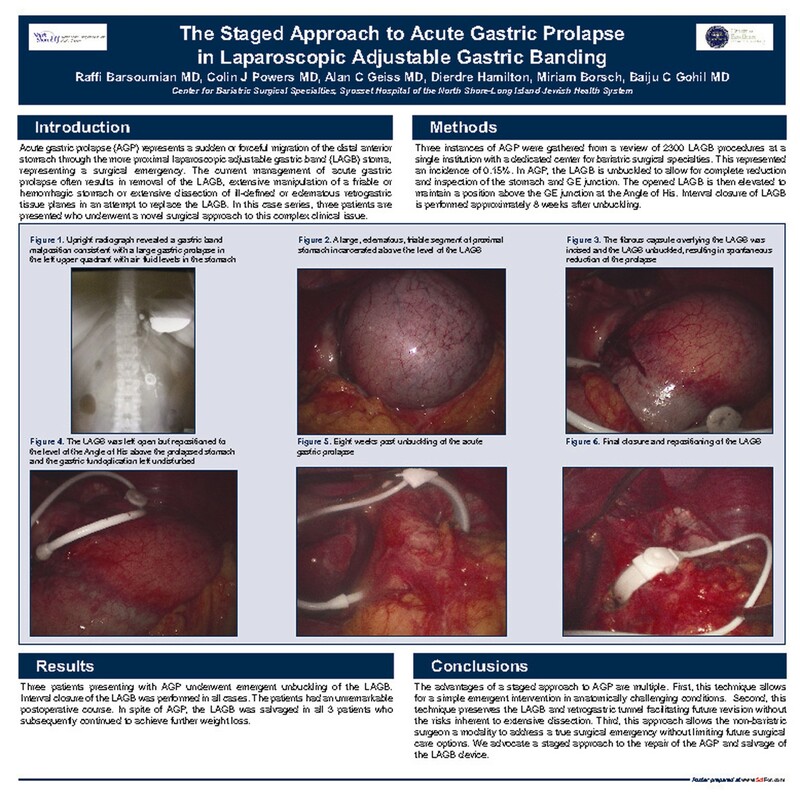 In AGP, the LAGB is unbuckled to allow for complete reduction and inspection of the stomach and GE junction. The opened LAGB is then elevated to maintain a position above the GE junction at the Angle of His. Interval closure of LAGB is performed approximately 8 weeks after unbuckling. RESULTS: Three patients presenting with AGP underwent emergent unbuckling of the LAGB. Interval closure of the LAGB was performed in all cases. The patients had an unremarkable postoperative course. In spite of AGP, the LAGB was salvaged in all 3 patients who subsequently continued to achieve further weight loss. CONCLUSIONS: The advantages of a staged approach to AGP are multiple. First, this technique allows for a simple emergent intervention in anatomically challenging conditions. Second, this technique preserves the LAGB and retrogastric tunnel facilitating future revision without the risks inherent to extensive dissection. Third, this approach allows the non-bariatric surgeon a modality to address a true surgical emergency without limiting future surgical care options. We advocate a staged approach to the repair of the AGP and salvage of the LAGB device.